Kostas Passaris was an armed robber and murderer; convicted for a string of armed robberies and assaults; escaped Korydallos Prison in Athens in February 2001 while being transferred to a hospital, killing two policemen in the process; arrested in November 2001 in Bucharest and is currently jailed in Romania. He was once the most wanted man in Greece and its most notorious criminal. His hands were dyed in the blood of citizens and policemen, and he managed to discredit and "decapitate" the Greek Police by escaping arrest and fleeing after committing a host of felony offenses. Now he is ready to devote his life to God hoping that - if and when he is released from prison - he will become a monk at Mount Athos. The notorious criminal Kostas Passaris, the man who was described as "the beast of the Balkans" and since 2001 is held in the maximum security prison Gkerlas in Romania, appears to regret his sinful past, and as another "black sheep" prays on his knees in his narrow cell asking remission of his sins and hopes that one day he will succeed in ... wearing the cassock and entirely devote himself to his Lord and Creator. This is what is claimed in an interview which was given to the newspaper Jurnalul National of Bucharest with the priest to whom is credited this dramatic shift of the criminal, known as the "saint of prisoners", Archimandrite Gervasios John Raptopoulos. 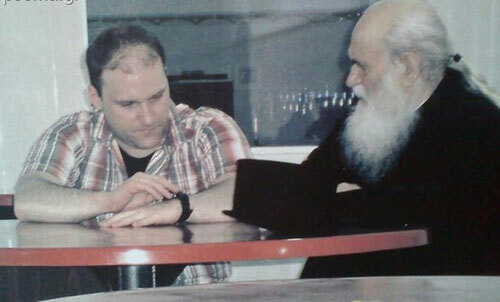 The 80-year-old Archimandrite, founder of the brotherhood "Saint Xeni - Diaconate for the Release of Poor and Prisoners" came into contact with Passaris last Easter when, while he was in Romania, he learned that the 34-year-old criminal was desperately asking to meet him. After obtaining the necessary authorization from the Romanian Ministry of Justice, Father Gervasios met Passaris in the presence of the director of prisons, and even four fully armed guards watching the meeting with their finger on the trigger. Since then, the communication became more frequent, and the "spiritual father" of Passaris started visiting him and supplies him with ecclesiastical books (some of which are considered - such as The Ascetic Writings of Abba Dorotheos - particularly difficult and read by monks of Mount Athos), while for his part, the criminal has taken a particularly hard monastic lifestyle and started fasting every Wednesday and Friday, without regard even for derision by many fellow inmates. According to reports, the daily "ecclesiastical" program of the criminal begins early in the morning. Immediately when he wakes up he prays the Orthros for the day, then a few hours later says the Paraklesis, in the evening he says the Esperinon, and at night he ends with the Small Apodeipnon. Indeed, at 3:00 in the morning Passaris wakes up and prays the Midnight Service, and immediately after begins his Monastic Canon (ecclesiastical prayers for the monastic order). Specifically, he takes in his hands his prayer rope and begins to pray, while doing prostrations! According to statements by the Archimandrite in the Romanian newspaper, the prison has radically changed Passaris, who now communicates better and is more open, having turned to God. When I saw him for the first time, the child was contrite and confessed for about a half hour. I gave him a beautiful icon of the Panagia and told him, "Kosta, this is an icon that moves me deeply." He responded to me: "Elder, give it to me that I may kiss it, but forgive me, I will not hold on to it because it reminds me of my mother." This child never knew a mother. For me he is on the road of repentance and loves very much the Athonite fathers. All the books he reads speak of repentance. He is my spiritual child. Orthodoxy receives in its embrace all people and does not discriminate even for the most dangerous criminals. The particular case of Kostas Passaris could not be an exception because, according to reports, he is said to have regretted his actions and through confession to his spiritual father has sought absolution and expressed a desire to become a monk. However, in order to follow the path of monasticism he must first be released from serving two life sentences. If this were to happen then he can go to a monastery, after filing his criminal record and successfully passing the probationary period of a few months which applies to all novices. During the probationary period the novice wears civilian clothing and not a cassock. If he qualifies then he is able to become a monk, after it is judged by his spiritual father, who certifies the repentance of the novice. From there it is determined that he is ready to leave the world like all monks and follow the path of God.